One hundred years after a small band of men left Maynooth to participate in the 1916 Rising, around 120 people took part in a re-enactment of this historic event on Saturday, April 23, 2016. Organised by ‘The Maynooth 1916 Centenary Committee’ the aim was to walk in the footsteps of the ‘Maynooth 15’. 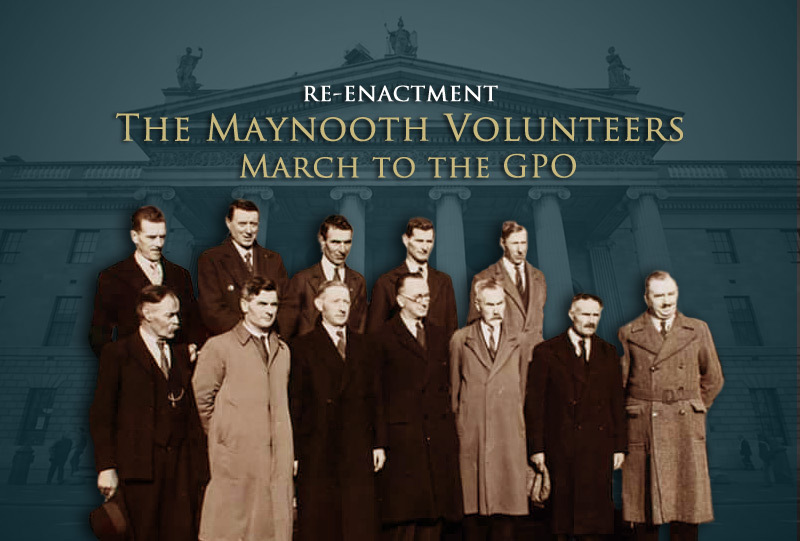 Participants left the grounds of Maynooth College, as did the Volunteers one hundred years before, to walk the 15 miles to the GPO in Dublin. One hundred years after a small band of men left Maynooth to participate in the 1916 Rising around 120 people took part in a re-enactment of the historic event on Saturday, April 23, 2016. Organised by ‘The Maynooth 1916 Centenary Committee’ the aim was to walk in the footsteps of the ‘Maynooth 15’. Participants, organisers and supporters gathered at the grounds of Maynooth College, where after registering for the walk, the crowd was addressed by Monsignor Hugh Connolly who read from the eyewitness account of the Very Reverend Monsignor Hogan. On Easter Monday 1916 Monsignor Hogan had appealed to the Maynooth 15 to go home saying they were ‘poor fools who were going to be slaughtered by the British. His appeals went unheeded and reluctantly he gave the men his blessing. This time the blessing came more willingly, as Monsignor Connolly joked with the crowd. The St. Mary’s Brass and Reed Band led the procession off from the College Gates to the Harbour where a descendant of one of the Maynooth 15 waved a flag to signal the start of the walk. It was a nice warm day perfect for a saunter along the Royal Canal, but the pace was steady enough if we wanted to keep to our schedule and reach Binns Bridge by 5.00 pm. By the time we reached our first water break my legs were quite aware that I had walked 5.3 miles. We stopped at the boat slip and amenity area on the Kildare-Dublin county boundary where refreshments and toilets were provided by Waterways Ireland. After a welcome 10 minute break we walkers started off again on to our final water break, another five miles at Talbot Bridge, Blanchardstown, with refreshments sponsored by Super Valu Maynooth. We were now on the ‘home straight’ and pushed on for the remaining five miles and reached Binns Bridge on time. Here we grouped together for the walk to the Garden of Remembrance. Several Gardai on pushbikes ushered the walkers into the bus lane and we proceeded down Dorset Street, Frederick Street North and to the Garden of Remembrance. And the chance once again to prove we’re men. From first hearing about the Maynooth 15 many years ago I have written and talked about these brave men so much that I felt I had to do the commemorative walk. On reaching Dublin I tried to put myself in their shoes 100 years ago. After walking 15 miles carrying rifles, grenades, ammunition and possibly some food the Maynooth 15 arrived at the GPO to be welcomed by Patrick Pearse and James Connolly. They were giving a short rest before being sent to Parliament Street to relieve rebels under attack by British troops. Despite having little or no military experience – only Tom Byrne had being in combat before – they acquitted themselves well. However, they were forced to retreat and returned to the GPO where they served for the remainder of the week before the evacuation and surrender. While some walkers made their way down to the GPO the memorial garden was a fitting place to end the walk and is dedicated to the memory of ‘all those who gave their lives in the cause of Irish Freedom’. After a group photograph at the ‘Children of Lir’ sculpture the tired but proud walkers made their way home. However, my trial was not over. The next morning I was up early and back in Maynooth where I was the official starter to the ‘Rebellion Run’ the Maynooth 10k/5k Challenge. Registration began at 8 am to 10 am in Maynooth Post Primary and then it was down to the College Green where hundreds of runners and walkers were performing stretches and exercises before the start of the run. The Maynooth 10k/5k Challenge was organised to coincide with the 100th anniversary of the Rising (24 April 1916) and on hand to spur on the challengers were two of the organisers Gerry Quinn and Teresa Murray and Joe Buckley, grandson of Domhnall Ua Buachalla. At 10.30 am the Historian in Residence gave the countdown and the Rebellion Run was off. The finish was at Carton Avenue and each participant was given a specially designed commemorative medal as a ‘thank you’ for supporting the event. For the walkers and runners of this momentous 2016 weekend there was plenty of refreshments, encouragement, rest and recuperation. For the Maynooth 15 of 1916 there was imprisonment, little encouragement and a many years of violence and strife ahead. But for all participants, 100 years apart, there was satisfaction and comradeship, perseverance and pain, but a job well done. Domhnall Ua Buachalla was not a young man; he was fifty years of age, but he took the decision to leave his wife, Sinéad, and their seven children and walk into the unknown. The parting was hard, but inevitable given that Sinéad was aware that her husband was deeply involved in the revolutionary movement and their premises was a storing place for arms and ammunition.